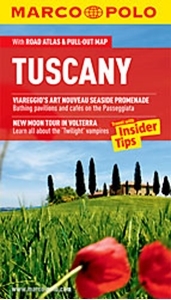 Tuscany in the new Marco Polo Guide series designed to enable travellers to have fun and feel relaxed the moment they arrive to their destination. In a compact format and budget-priced, these guides feature full colour and high quality content with unique insider tips. The information is presented in a straightforward and engaging format with three main sections: an introduction to the location and including highlights and insider tips, a sightseeing and entertainment part, and a practical information chapter; all accompanied by atlas pages and a pull out map. The guides starts with a geographical and historical context, suggestions on what not to miss, great places for free, what to do if it rains, chill out, relax and unique experiences to make the visit even more memorable. The perfect route/day will show the best way to get to know a destination for those with limited time. The sightseeing chapters organise the area in sections and for each one show suggested routes, referenced to the atlas and pull-out map, best places and attractions with practical tips on how to avoid queues, get the best views, where to eat and drink, shopping, entertainment, where to stay and much more. The last section offers a few tours suggestions, travel with kids special pages, festivals and events calendar, travel tips, useful phrases and dos and don’ts. The road atlas pages offer detailed mapping cross-referenced to the sites featured in the book, and a fully indexed pull-out map with its own plastic wallet at the back of the guide.